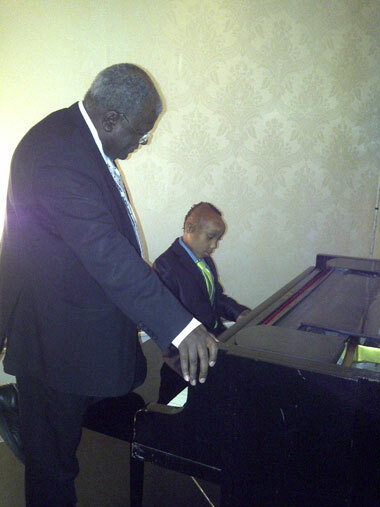 On the evening of Tuesday 15th November 2011, Sizwe (10) spent time with Prof Jonathan Jansen on the grand piano in the ballroom of the Mount Nelson Hotel in Cape Town. They were both guests at the Inyathelo Philanthropy Awards. Inyathelo is a word in isiXhosa meaning "initiative". Jonathan Jansen is Rector and Vice-Chancellor of the University of the Free State. He is the Honorary Professor of Education at the University of the Witwatersrand and Visiting Fellow at the National Research Foundation. Sizwe Elphin Lloyd Jones was born Hlophe. He is an honorary Prince of the Amangwane tribe of Natal, South Africa. Sizwe has been adopted by Bronwen Jones. Sizwe's two middle names are taken from his great-uncle Elphin Lloyd Jones, a child genius who sadly died in Britain at the age of 12. There was an educational fund named after Elphin at Coleg Harlech in Wales. Coleg Harlech was set up by Dr Thomas Jones CH (1870-1955), particularly to foster the joy of adult education - for the sheer pleasure of learning. Sizwe's great grandfather Dr Thomas Jones, CH was once described as "one of the six most important men in Europe", and was advisor to four Prime Ministers (Lloyd George, Bonar Law, Baldwin and MacDonald); his official title was Deputy Secretary to the Cabinet. His diary threw much light on politics "behind the scenes", including the Irish Treaty, the General Strike, the meetings between Lloyd George and Hitler, the Cliveden Set, and so on. 311 volumes of his papers at the National Library of Wales "comprise one of the finest archives in the country." Sizwe, while only ten years old, has already rubbed shoulders with South Africa's leading academics and musicians, and is proud of his links to a historic Welsh family and equally proud of his links to a historic royal African family. We hope that this little boy goes far in life. Mr Shearer commented to Bronwen Jones: "Congratulations on your award last night! Here is a photograph of your son with Prof Jansen - quite a fantastic pair!! "We wish you much joy in your work with plenty of stamina and courage!! People like you make others feel, very, very deeply.....and you certainly impacted me with your extraordinary dedication, passion, courage and calmness.....thank you!